Ever since we released the rigid USB packaging solution, the Flashpad™, it has grown to become one of our most popular and useful products. The idea originally came from the need to add shelf presence to an otherwise forgotten promotional giveaway. Think about marketing events and promotional mailer attempts that you have received. Often the postcard, small office utensil, or pamphlet goes noticed but discarded and forgotten. By developing the Flashpad™, we created an affordable packaging solution that offers you more real estate for branding as well as a display feature for your promotional flash drive. USB flash drives are extremely useful in an office setting and make information distribution a piece of cake. 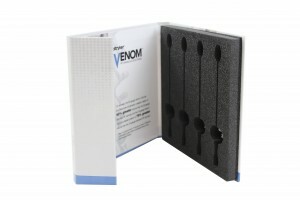 By using USB packaging like the Flashpad™, companies guarantee that their marketing efforts do not go unnoticed. As a custom manufacturer, we receive a wide range of needs and requests from our customers. Our versatile output and flexible manufacturing team are able to create elaborate and unique luxury packaging solutions. So when some of our clients wanted to take the concept of the Flashpad™ and tweak it to hold something different, we were all on board! Shown here are just a couple of variations of the Flashpad™ that show just how customizable this USB packaging solution is. Made with a simple turned edge flat with customer supplied artwork, we are able to provide unique die-cut foam to be adhered in this hardcover “book”, if you will. If you want to see how the Flashpad™ is made, or any of our other interactive packaging products, visit our youtube channel to see what we have to offer!